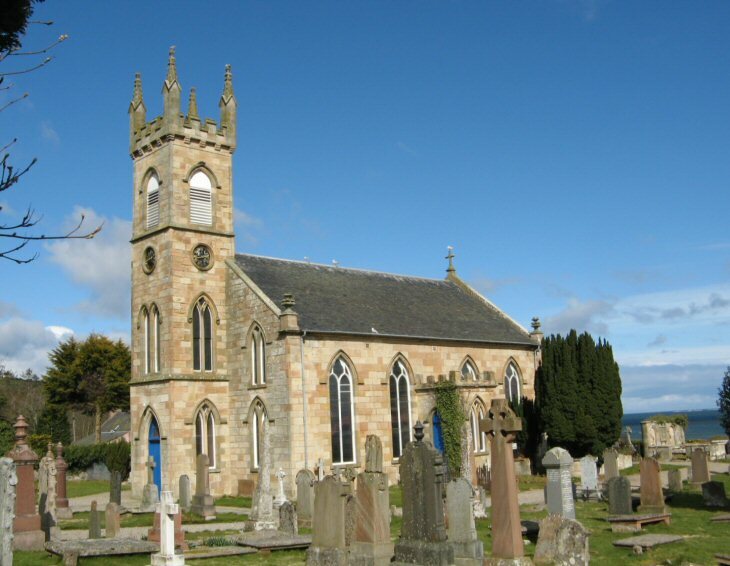 Rosemarkie was an important Christian centre in the 8th & 9th centuries. Carved Pictish stones have been found in and around the churchyard and have been removed for display in the village's Groam House Museum, the principal archive of Pictish history in Easter Ross. The Highland Family History Society carried out a survey of inscriptions in 2004. As part of that survey, a number of stones were unearthed and the turf replaced following recording. In these cases, the principal inscribed names are noted in the title of the image together with details of how to acquire the HFHS's publication to read the complete inscription. How can I access the survey of inscriptions? My family [the Junors] came from Rosemarkie in the mid 1800's and settled in Victoria. I am trying to cross reference my information. Added by John Junor on 10 February 2015. David Tulloch FORBES was buried on 13 Jan 1893 in the Rosemarkie burying-ground. He was aged about 63 years. Is it possible to get access to headstone inscriptions and/ or a list of those buried there please? Added by Wendy Forbes on 31 July 2015. I don't know if this is the same as the MI book but it has been very helpful to me. Added by Lisa Henderson on 17 November 2015. Thank you Lisa for sharing the excellent Survey of Inscriptions in Rosemakei church yard. It so well done, and informative, but unfortunately I found no entry for David Forbes. Perhaps his was one of the few unreadable stones, or his family didn't see fit to mark the grave. Added by Wendy Forbes on 18 November 2015.